After the run of the TV show, “The Brady Bunch”, Maureen McCormick’s life was nothing like Marcia’s storybook existence. In fact, it was a nightmare. The actress had developed an “all-encompassing” addiction to cocaine at the age of 20, and began a downward spiral that threatened to wreck her career. After the movie, “The Brady Brides”, her lowest point, she began on her road to recovery and overcoming clinical depression. She has been sober for 30 years. She tells her personal story of dealing with mental health issues in her autobiography, “Here’s The Story: Surviving Marcia Brady and Finding My True Voice.”. Maureen opens up about growing up in front of American and how her home life was the exact opposite of what America saw on television. Dealing with a family history of mental illness, Maureen tells of her experience with her family, their past, and then dealing with depression and addiction in her own life, just at the time when she was at the height of her career. Personal and family secrets are contributing factors toward poor mental health, says Maureen McCormick, a star of the 1970s sitcom “The Brady Bunch.”. McCormick described discovering her family’s history of mental illness as a child and her own reluctance to tell her daughter, now 20, about her own battles with drug addiction, bulimia and depression. sweet and popular Marcia Brady. But after the show ended, McCormick battled severe drug addiction (cocaine, quaaludes), bulimia and depression. She re-entered the TV world in 2007 appearing as a contestant on “Celebrity Fit Club,” which follows celebrities as they try to lose weight. McCormick won the contest, and talked about the link between her weight gain and depression. After the show, she realized she wanted to publicly address her mental health and addiction problems. The result was a book, published late last year, titled “Here’s the Story: Surviving Marcia Brady and Finding My True Voice,” and a commitment to fighting the stigma and silence that can surround mental illness. McCormick appeared on “The Brady Bunch” from 1969 to 1974. McCormick has a horrifying family history of mental illness, from suicidal grandparents to a mentally ill mother to brothers who are schizophrenic. In her appearance at the APA, she described feelings of emotional pain and sadness that began early in her life, even before she discovered her family’s turbulent mental health history. 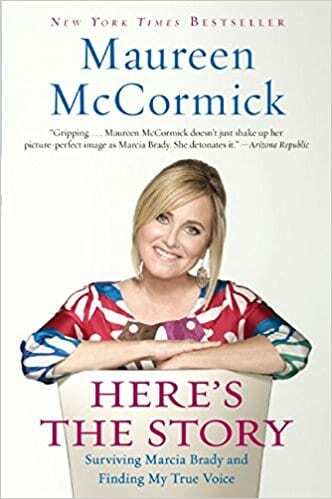 Maureen’s autobiography, “Here’s The Story: Surviving Marcia Brady and Finding My True Voice”, went to #4 on the New York Times Bestseller list. In it she tells a deeply personal story of the multi-generational legacy she inherited from her parents and carried with her through the fast-lane cocaine dens and power centers of Hollywood. Her life-long struggle with addictions continues to this day as a wife in a nearly 26-year marriage and as the mother of a 21-year-old daughter. Through faith, family, friends and therapy, Maureen has found her center and the strength to face down everyday challenges – like the elder abuse of her father, the temptations of an addictive personality, old fashion Hollywood stereotyping and overcoming depression. She recognizes every day as a gift and knows the greatest gift is in helping others face their everyday challenges.